FAUCET TIPS & TRENDS BY INTERIOR DESIGNER "JANE"
A Graff faucet takes center stage in the kitche. It's a hard-working yet beautiful addition to the busiest room in the house, and certain to be the focal point of your design. 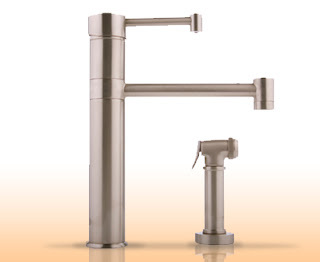 From a traditional farmhouse kitchen to a sleek urban motif, Graff has the faucet you've been searching for. Give your kitchen sink a splash of style with the addition of a daring wall-mounted faucet, or go the practical route by choosing a pullout model with built-in sprayer. You'll feel confident knowing that your Graff faucet will be as functional as any appliance in your kitchen, yet durable enough to stand up to the rigors of everyday use. American ingenuity and European craftsmanship are the cornerstones of GRAFF's design commitment to create innovative, cutting-edge mixers (faucets) and plumbing accessories.